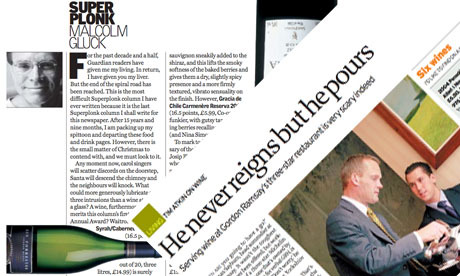 When The Guardian and The Observer allowed wine writers to write … columns by Malcolm Gluck and Tim Atkin from 2004. This week the wine columnist on the London Evening Standard, Andrew Neather, wrote his last column, and another nail was grimly hammered into the creaking coffin that is bulging full of discontinued or horribly diminished wine columns in the British media. Take the newspaper(s) I work for. Not that long ago, The Guardian was handing over 900 words in their Weekend magazine to Malcolm Gluck’s then-popular Super Plonk column. At the same time Tim Atkin got between 500 and 800 weekly words in the Observer, and not far off a thousand in their monthly foodie special OFM. Now The Guardian gives Fiona Beckett 400 words, which makes is spectacularly hard to write anything interesting if you’ve also got to recommend and briefly describe half a dozen wines. What’s left is a couple of paragraphs of actual writing, followed by a very slightly glorified shopping list. How The Observer’s David Williams must pine even for that – he’s got an unglorified one, consisting of one short paragraph on each of three wines, a sum total of 200ish words. Newspaper editors might not like wine very much, but (as a rule) they aren’t idiots, and they no longer rely on mere hunches to make their decisions. Changes to national papers are focus-grouped to oblivion before they’re allowed anywhere near the street, and presumably the focus groups haven’t contained many more wine nuts than the average editor’s office. But there is a problem in the journalists’ logic here: if big wine columns are a waste of space because only a few ultra-committed drinkers are interested in them, short wine columns are a bigger waste of space because not even the ultra-committed drinkers are interested in them. Food writing is massively popular at present, but that is at least in part because writers are given space to make it interesting. If Nigel Slater wants to tell us about lasagne, he can write a meandering 500 word introduction and follow that with a detailed recipe. If he lived in wine-writer-world, he’d be ordered to concentrate on supermarket produce and given so little space what you’d end up with is: “Tesco’s Finest lasagne is OK, but I prefer the one from Waitrose, which is on promotion this week at £2.49.” With such tight constraints, what’s needed isn’t a writer, it’s a magician. With the honourable exceptions of the Telegraph and the Financial Times, where Victoria Moore and Jancis Robinson are allowed enough space to be interesting, the national press is failing wine fans and the trend is horribly downhill. But it’s still hard to understand precisely why. Given the size of weekend papers, and the number of words they devote to news about nothing, interviews with nobodies and random columnists detailing the hilarious thing that they saw in their sock drawer the other day, I’m continually flummoxed by their refusal to give any attention to wine. They may say that wine columns are boring and no one reads them, but I would argue that it is shopping lists that are boring and they could do with honing the concept. Any publication that works out how to show me the beautiful scenery and introduce me to the fascinating characters that I have seen and met on those sadly rare occasions when I visit winegrowing areas will gain at least one new reader, and I suspect many more.